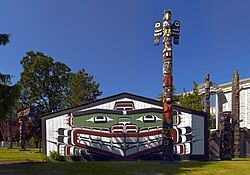 A potlatch is a festival ceremony practiced by Indigenous peoples of the Pacific Northwest Coast in North America, along Pacific Northwest coast of the United States and the Canadian province of British Columbia . This includes Haida, Nuxalk, Tlingit, Tsimshian, Nuu-chah-nulth, Kwakwaka'wakw, and Coast Salish cultures. The word comes from the Chinook Jargon, meaning "to give away" or "a gift". It is a vital part of indigenous cultures of the Pacific Northwest. It went through a history of rigorous ban by both the Canadian and United States' federal governments, and has been the study of many anthropologists. potlatch is a festival or ceremony practiced among Indigenous peoples of the Pacific Northwest Coast. At these gatherings a family or hereditary leader hosts guests in their family's house and hold a feast for their guests. The main purpose of the potlatch is the re-distribution and reciprocity of wealth. Different events take place during a potlatch, like either singing and dances, sometimes with masks or regalia, such as Chilkat blankets, the barter of wealth through gifts, such as dried foods, sugar, flour, or other material things, and sometimes money. For many potlatches, spiritual ceremonies take place for different occasions. This is either through material wealth like foods and goods or non-material things like songs, dances and such. For some cultures, like Kwakwaka'wakw, elaborate and theatrical dances are performed reflecting the hosts' genealogy and cultural wealth they possess. Many of these dances are also sacred ceremonies of secret societies like the hamatsa, or display of family origin from supernatural creatures like the dzunukwa. Typically the potlatching is practiced more in the winter seasons as historically the warmer months were for procuring wealth for the family, clan, or village, then coming home and sharing that with neighbors and friends. "We will dance when our laws command us to dance, and we will feast when our hearts desire to feast. It is a strict law that bids us dance. If not, you will be welcome to us." Celebration of births, rites of passages, weddings, funerals, namings, and honoring of the deceased are some of the many forms the potlatch occurs under. Although protocol differs among the Indigenous nations, the potlatch will usually involve a feast, with music, dance, theatricality and spiritual ceremonies. The most sacred ceremonies are usually observed in the winter. It is important to note the differences and uniqueness among the different cultural groups and nations along the coast. Each nation, tribe, and sometimes clan has its own way of practicing the potlatch so as to present a very diverse presentation and meaning. The potlatch, as an overarching term, is quite general, since some cultures have many words in their language for all different specific types of gatherings. Nonetheless, the main purpose has been and still is the redistribution of wealth procured by families. Before the arrival of the Europeans, gifts included storable food (oolichan [candle fish] oil or dried food), canoes, and slaves among the very wealthy, but otherwise not income-generating assets such as resource rights. The influx of manufactured trade goods such as blankets and sheet copper into the Pacific Northwest caused inflation in the potlatch in the late eighteenth and earlier nineteenth centuries. Some groups, such as the Kwakwaka'wakw, used the potlatch as an arena in which highly competitive contests of status took place. In some cases, goods were actually destroyed after being received, or instead of being given away. The catastrophic mortalities due to introduced diseases laid many inherited ranks vacant or open to remote or dubious claim—providing they could be validated—with a suitable potlatch. The potlatch was a cultural practice much studied by ethnographers. Sponsors of a potlatch give away many useful items such as food, blankets, worked ornamental mediums of exchange called "coppers", and many other various items. In return, they earned prestige. To give a potlatch enhanced one’s reputation and validated social rank, the rank and requisite potlatch being proportional, both for the host and for the recipients by the gifts exchanged. Prestige increased with the lavishness of the potlatch, the value of the goods given away in it. Potlatching was made illegal in Canada in 1885 and the United States in the late nineteenth century, largely at the urging of missionaries and government agents who considered it "a worse than useless custom" that was seen as wasteful, unproductive which was not part of "civilized" values. Sustaining the customs and culture of their ancestors, indigenous people now openly hold potlatch to commit to the restoring of their ancestors' ways. Potlatch now occur frequently and increasingly more over the years as families reclaim their birthright. The ban was only repealed in 1951. Guy Debord, French Situationist writer on the subject of potlatch and commodity reification. Pow wow a gathering whose name is derived from the Narragansett word for "spiritual leader". Potlatch. Oxford English Dictionary. Retrieved on April 26, 2007. Potlatch. Dictionary.com. Retrieved on April 26, 2007. Aldona Jonaitis. Chiefly Feasts: The Enduring Kwakiutl Potlatch. U. Washington Press 1991. ISBN 978-0295971148. Seguin, Margaret (1986) "Understanding Tsimshian 'Potlatch.'" In: Native Peoples: The Canadian Experience, ed. by R. Bruce Morrison and C. Roderick Wilson, pp. 473-500. Toronto: McClelland and Stewart. Mathews, Major J.S. Conversations with Khahtsahlano 1932-1954, Out of Print, 1955. ASIN: B0007K39O2. p190, 266, 267. An Act further to amend "The Indian Act, 1880," S.C. 1884 (47 Vict. ), c. 27, s. 3. U'mista Museum of potlatch artifacts. Potlatch An exhibition from the Peabody Museum, Harvard University. Money An analysis of Potlatch and modern versions of the same from a psychohistorical perspective. Not neutral point of view, but does provide references. University of Washington Libraries Digital Collections – Oliver S. Van Olinda Photographs A collection of 420 photographs depicting life on Vashon Island, Whidbey Island, Seattle and other communities around Puget Sound , Washington , from the 1880s through the 1930s. This collection provides a glimpse of early pioneer activities, industries and occupations, recreation, street scenes, ferries and boat traffic at the turn of the century. Also included are a few photographs of Native American activities such as documentation of a potlatch on Whidbey Island. Anash Interactive - An online destination where users create comics, write stories, watch webisodes, download podcasts, play games, read stories and comics by other members, and find out about the Tlingit people of Canada.